Most readers will know I wouldn’t normally do a cookbook review. When it comes to a friend though, well, I couldn’t help but be enthusiastic about a cookbook that has been painstakingly researched and beautifully put together now, could I? This cookbook is a one of a kind. A Helping Hand has been written by a girl called Frog. Her real name is Rowena, but she prefers Frog. Frog hails from the UK and writes a blog called Changmoh. She’s lived in Singapore for over eight years and noticed that a lot of cooking terminology got lost in translation with maids. Whilst Filipino maids speak English, cooking terms in particular can be very tricky to translate. 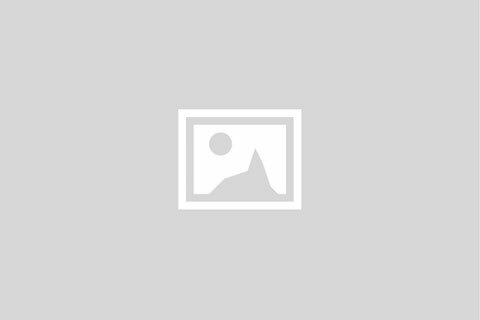 So Frog went about creating a cookbook with more than 80 recipes for classic foods. Then she had each recipe translated from English into Tagalog (Filipino). 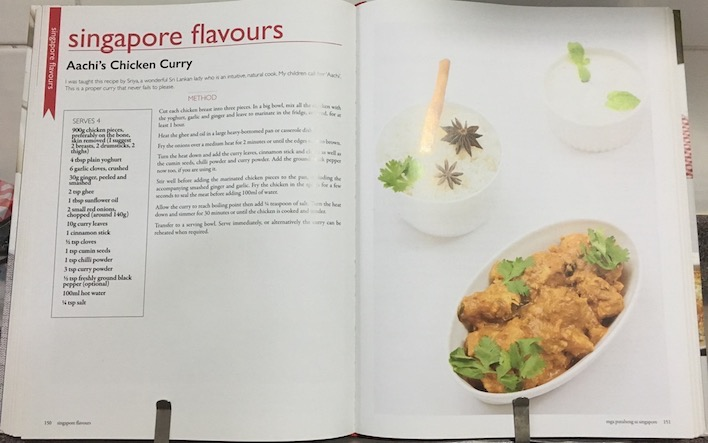 Each recipe in the book is shown first in English, followed by a full Tagalog translation. There are beautiful photos for each recipe that add a visual dimension that I personally found very helpful when I used the book. One of the things maids love about the book is the detailed, “kitchen essentials, ingredients and index,” at the back. This section contains over 50 pages with detailed definitions of ingredients and cooking paraphernalia including photos to help explain their meanings thoroughly. There is also an English index as well as a Tagalog index. The book is beautifully presented and the translations are clear and easy to understand. The recipes are focussed on western dishes, although a few classic Singaporean dishes also feature. 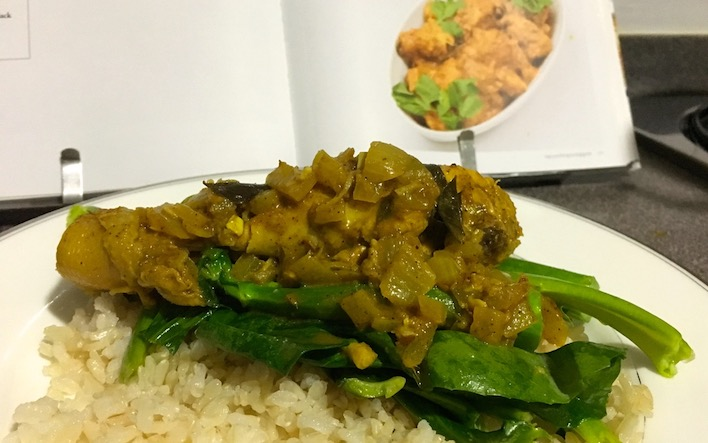 In fact I can vouch for Aachi’s chicken curry that was super easy to make and very tasty. To make you feel extra good about buying this cookbook a donation from each sale is made to HOME. HOME is the Singapore charity dedicated to upholding the rights of migrant workers. 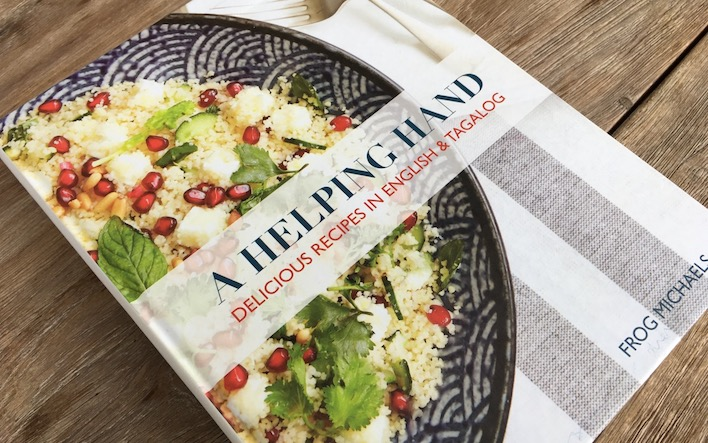 A Helping Hand is a great book to give as a gift to a new arrival in Singapore, or to a friend trying to educate a Filipino maid on western cooking methodologies. You can purchase the book on A Helping Hand’s website, or at book stores across Singapore. Nice work Frog!